Holy Assumption of the Virgin Mary Russian Orthodox Church is located on Mission Avenue in Old Town Kenai. Turn south on Main St. Turn right on Overland Ave. Turn right on Mission Ave.
6:00 PM Vigil followed by Confessions. 9:00 AM Divine Liturgy followed by Sunday School for children (see heading under Ministry Groups for Sunday School schedule). Fr Igumen Nikolai Militov established a permanent parish in Kenai. Fr Nikolai, son of a reader, was born in 1810 in Russia. He was a student in the Tambov Theological School and became a monk in 1837. In 1840 he went to Sitka, AK with Bishop Innocent. In Sitka he was a member of the Ecclesiastical Consistory and the head of the Bishop’s residence. On December 15, 1843, he was ordained Hieromonk. His travel journals are in the Archives of the Alaska Diocese, and the originals are in the Library of Congress. The first church in Kenai was built. Records indicate there were already 1,432 newly baptized Kenaitze Indians. Makary Ivanov, the reader, began traveling the peninsula to inoculate the Dena’ina for smallpox. Fr Nikolai died after serving the Kenai area for 22 years. Alaska was purchased by the United States. Makary Ivanov serves the church as Reader. 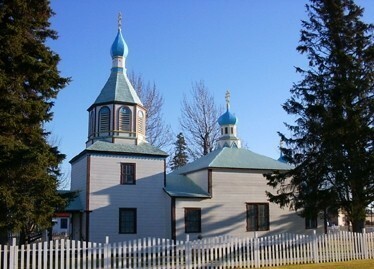 Hieromonk Nikita assigned to Kenai Mission. Fr Nicholas Mitropolsky served the church. Fr Alexandr Yaroshevich was the parish priest. Parish house was built. Today it is the oldest standing building in the Cook Inlet region. The present church was built to replace the first one with a grant of $400 from the Holy Synod of St Petersburg. Fr John Bortnovsky was the rector. The St Nicholas Chapel was built as a memorial to the heroic deeds of Fr Nikolai and Makary Ivanov, both of whom were instrumental in saving the lives of hundreds of Dena’ina from smallpox. The chapel was constructed on the site of the original 1849 church which was in the northwest corner of the original Russian fur trading post, Fort St Nicholas. Fr Paul Shadura was the rector, serving the mission without salary and building chapels for the mission in Tyonek and Seldovia. Deacon Alexander Ivanoff served the parish since a resident priest had not been assigned. Fr Michael Oskolkoff and Fr Simeon Oskolkoff served as visiting priests for Easter and other various services. Alaska became the 49th state. Fr Cyril Bulashevich was the rector. Church was dedicated as a National Historic Landmark. Frs Michael Oskolkoff and Simeon Oskolkoff served the parish as visiting priests. St Herman’s Seminary started in Kenai. Fr Macarius Targonsky served as resident priest. Fr Paul Merculief assigned temporary priest on a visiting basis. Fr Sergie Active served as resident priest. Fr Michael Trefon is serving as priest-in-charge. Built between 1894-96, the Holy Assumption Orthodox Church is the principal and most enduring example of Russian culture in south central Alaska. For the Kenaitze Indians, who comprise a significant portion of the population, this church constituted a major link to western culture. A simple, wood-frame structure with clapboard siding, Holy Assumption Church features a square two-story bell tower and a distinctive crown-shaped cupola, both with the three-bar Orthodox Cross. Of particular interest to historians is the interior. The icons, religious artifacts, and historic objects are important not only for their connection to the specific structure, but for the larger symbolic association with the Russian Orthodox faith. In addition to being the oldest standing Orthodox Church in Alaska, it is an excellent example of Pskov (ship or vessel) design. For its exceptional value in our Nation’s history, the Secretary of the Interior designated Holy Assumption Church a National Historic Landmark in 1970. Unfortunately, at this date, the long-term preservation of the Holy Assumption Church, with its rich collection of icons and historic objects, is jeapordized due to lack of funding for conservation work, proper environmental controls, and basic reparis. The most serious threat is to the church interior—its ornamentation and its artifacts. The structure remains in fairly good condition due to extensive rehabilitation efforts in 1978. This earlier work included applying insulation, constructing a new foundation, replacing deteriorated doors to match the original design, and installing code-required mechanical and electrical systems. Still, the major work- conservation of the icons and historic objects- remains. To accomplish this goal we will require further rehabilitation of the building to implement environmental and security systems. Finally, successfully preserving the artifacts themselves will require a major curatorial program.